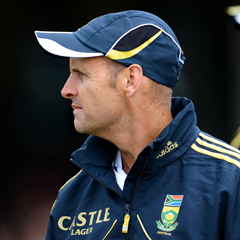 Cape Town - Proteas coach Gary Kirsten is hoping for an improved record from his one-day international (ODI) squad in 2013, starting with the series against New Zealand. The ODI squad has played 15 matches under the guidance of Kirsten since October 2011, winning 60 percent of those fixtures, a record the squad is keen to improve on. Kirsten was speaking at Claremont Cricket Club on Thursday, where the Proteas trained ahead of the first ODI at Boland Park in Paarl on Saturday. “We would like to perform at a higher level than we have,” Kirsten said, of his side, who are ranked No 1 in both ODI and Test cricket. Kirsten says he will be rotating his bowlers during the series, especially Dale Steyn and Morne Morkel, who are coming off high workloads in the Test format. The squad’s immediate focus is a series victory against the Black Caps, however the long term view towards the ICC Champions Trophy in the United Kingdom in July remains a priority. “It’s difficult to say,” Kirsten said when asked whether all the debut caps will play. “Obviously it is important for us to win the series but we will be rotating our bowling line-up so that will provide opportunities. We would also like to explore new talent as much as possible and I think this format of the game allows that, as does the T20 format. “It’s important for us as we prepare for World Cups in the future and an important tournament in June that we have a good understanding of who our key players are in certain situations,” he added.